Brydon Ring, a third-year Pharmacy student at Curtin University, shared his experience at ETG ‘18 of why being in the presence of the Holy Eucharist is so special. Photo: Matthew Lau. 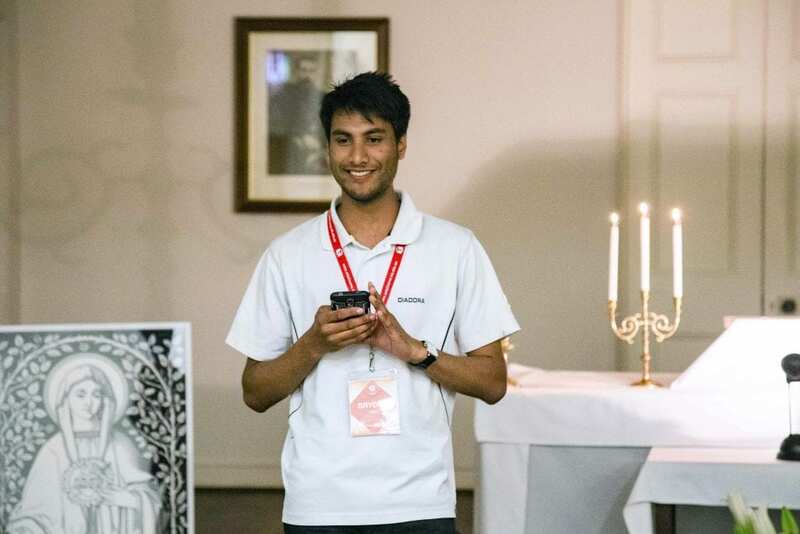 A 21-year-old man stepped up at Embrace the Grace 2018 to explain why Eucharistic Adoration is one of his favourite parts about being Catholic. Prior to the ETG ritual of Adoration on Friday 7 December, Brydon Ring helped put his fellow participants in the mood for deep prayer by giving his testimony of how Adoration has changed his life. Brydon’s passion for the hallowed Sacrament began at ETG in 2015 – his first of three trips – which he describes as “probably the best five days of my life” where he found fellowship and brotherhood in people “who truly love God”. “I’ve grown up Catholic my whole life, gone to Mass every weekend, but never felt connected to the faith even though I’ve served as an altar server and was an extraordinary minister in high school,” he began. His faith, however, grew upon learning more about basic Church history and theology at school. CYM chaplain Fr Mark Baumgarten exposes the Blessed Sacrament at St Gertrude’s Hall in New Norcia on 7 December 2018. Photo: Matthew Lau. Entering ETG in 2015 was a tricky time for Brydon, who found difficulty adjusting to university life and, as he openly admits, had issues with alcohol abuse. “One of the highlights of my experience at ETG has been the Friday night Adoration. I had never really experienced the real grace of Adoration until ETG in 2015,” he expressed. Sitting or kneeling in the real presence of Jesus Christ is the time when Brydon feels closest to God’s benevolence. Young people of God at Embrace the Grace 2018. Photo: Matthew Lau. Brydon, who is a youth leader and altar server at Sacred Heart Church in Thornlie, was last year diagnosed with depression and anxiety. “I was constantly overwhelmed with dark thoughts and guilt from my sins and I found myself constantly feeling unloved and unworthy of this life to the point where I was ready to end it,” he revealed. “But it was through this experience [of Adoration] that my relationship with God has developed and become so much stronger. This profound encounter with God has gradually helped Brydon’s equilibrium, who humbly says his life is now Christ-centred. “I’m a pretty emotional guy, but over [the past] year I’ve had some pretty powerful experiences during Adoration to the point where I’ve been ‘ugly crying’ because of the overwhelming love of our God,” he shared with his peers at ETG ‘18. Tara Prentice receives Christ during Mass at New Norcia on Sunday 9 December. Photo: Matthew Lau. Brydon encourages all faithful to spend time in Adoration whenever possible. “Do not be afraid of letting everything out, because this time is about you and your own personal relationship with Christ because He died to save us and be present with us today –lay it all before Him. “Don’t be afraid to give your whole life to Him because that is when you will truly experience His saving power,” Brydon concluded.